I'm bummed....one of my favorite local (Arizona) shopping places has closed their doors. Sad news....Domestic Bliss (in Mesa) is no longer. We've talked about them several times on the blog. Truly an inspirational store that has been around for a long, long time. They will be missed! Found, their sister store is still open by appointment and promises to have a monthly event for us to attend. Let's hope they keep it going. A fairly new place in town. They have been around since the end of last year, but this is my first chance to check them out. They are open 4 days on the 3rd weekend of every month. For some reason those 4 days, every month I have not been able to attend so I was happy to finally see what they are all about. They find new treasures and create new displays each month to make the store fun and fresh each time you visit. I picked up a few of these mini flashcards. Love how these crates are held together with C-clamps. This is the back side of a cabinet of small drawers. All the drawers are actually old wooden cigar boxes. The fronts are all painted grey, but I love the back side better, where you can see the labels and graphics. Fabulous ski rack....Paula has one of these up in her family room. Here are a few more photos I found on their blog. The sale started on Thursday and I didn't get to go until Friday, so this is what I missed out on. Love the large letters on the back wall, I think there was a lone "S" hanging on the wall when I got there! And, love that stool with the back. Apparently they have done well since next month they are moving to a new location just down the street. They will be right next to Paris Envy and promise cool air conditioning and lots of parking....both a problem at the current location. I love that this is turning into a destination area with Melrose Vintage, Rust and Roses and several other shops in the area all on 7th Avenue south of Camelback Road. Is is me or are the good places becoming harder to find!! I'm searching to find some new places to haunt. Do you have some favorite "go to" places to share with us? Of course we would love places that are near to us (California and Arizona), but both Paula and I love to travel and would be happy for a reason to go on a trip. Share with us your favorite places to find not only wonderful things, but lots of inspiration. We'll gather all your suggestions and share what we come up with. Congratulations - email us with your address. Looks like the place to visit. If you ever make it to NC, be sure to visit the Flea Market in Raleigh and the Scrap Exchange in Durham! There's a great place in Sebastopol, CA, called Ray's Salvage. It's on Hwy 116 and has loads of old doors, windows, door knobs, cabinets made out of other things like windows, etc. One of my favorite stops on my way to Mom's house in Camp Meeker. In Nevada, we have a fun thrift store on Gentry Way that has great prices and a good place to find books that aren't overpriced like a certain big chain thrift store does. We're planning a weekend in Chandler, AZ in early June so I'm looking for shopping places - thanks for these suggestions. 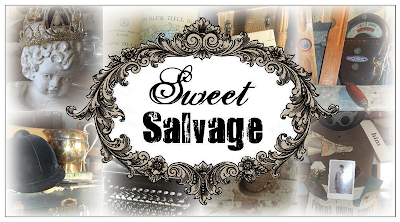 I love shopping in little "finds" like Sweet Salvage. There's not a lot here in Connecticut but just north of us is Brimfield, MA and they have a wonderful flea market up there that's HUGE! I thought I was going to finally see Domestic Bliss when I visit in Gilbert on Mother's Day week Very disappointed to hear they closed. There are several neat places to shop in downtown Carlsbad, CA. Will try to put in a post with their names later. Hi, I used to live Minnesota and loved going to Art and Architecture in Minneapolis! The place is huge with everything salvaged from homes, hotels, and churches. Right next door ( in the same building) there is a great place to get lunch and wonderful cupcakes! So sad to see another great store go down. We've lost all of our scrapbooking stores in Tucson now. As for treasures like these, I am betting that you've visited some of our little hot spots...Christine's, Tubac..so come on down! Thieves Market is a pretty decent occasional Flea Market in Cave Creek. I am looking forward to "Junk in the Trunk" event at Westworld May 5th!!! I like going to Anthropologie just to see their use of vintage times in their displays. They always have memorable display arrangements. We just got back from visiting Phoenix and was SO bummed that Melrose Vintage was closed on the only days we were there:( We did make it in to see other stores including the gorgeous Rust and Roses and Retro Ranch. We LOVED the Van Gogh exhibit at the Arizona Science Center and had the most delicious lunch at Pizzeria Blanco. I also get bummed when I see that an awesome store closes! I now live in Minneapolis but if you ever get to the Dallas area, please check out Heirlooms Antique Shop. I have posted photos on my blog (if you're interested)after my last visit. Yikes...that was September 2010! It's already been way too long since I have had an opportunity to shop there. I am always looking for new inspiring stores and know that there are lots in my area! Gosh, I wish we had a store like this where I live. When I was little, (40 years ago), my mom and her friends would go to this antique store out in the middle of the country. It was so much fun to walk around in there and check out all the "old" stuff. The lady that ran it was so nice too. Wow! What a trip down memory lane! Thanks!